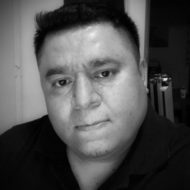 Percussionist Isaac Salazar is from Posoltega, Chinandega – Nicaragua. He started playing the guitar when he was five years old, and the piano when he was 10 years old. He received piano instruction at the National Music School of Nicaragua in the late 1990s. Through his time as a music student, he was an active musician playing in different bands of popular music throughout Nicaragua. In 2001, Isaac moved to the United States. Initially he started playing as a volunteer at St. Paul Catholic Center, in Bloomington, IN. In 2006 was hired as the piano player for Mundo Beat Entertainment in Indianapolis, IN. In 2015, he started working at Christ Church Cathedral, Indianapolis. More recently he completed training as a DJ at Deckademics – DJ School in Indianapolis, IN. He is currently one of the most active Latin percussionist in the midwest, seeked by many bands in Indianapolis due to his vast knowledge of styles, popular music practice and reliability.